PPM has officially presented that party ticket for the Presidential Election this September to the current President of the Maldives, Abdulla Yameen Abdul Gayoom. 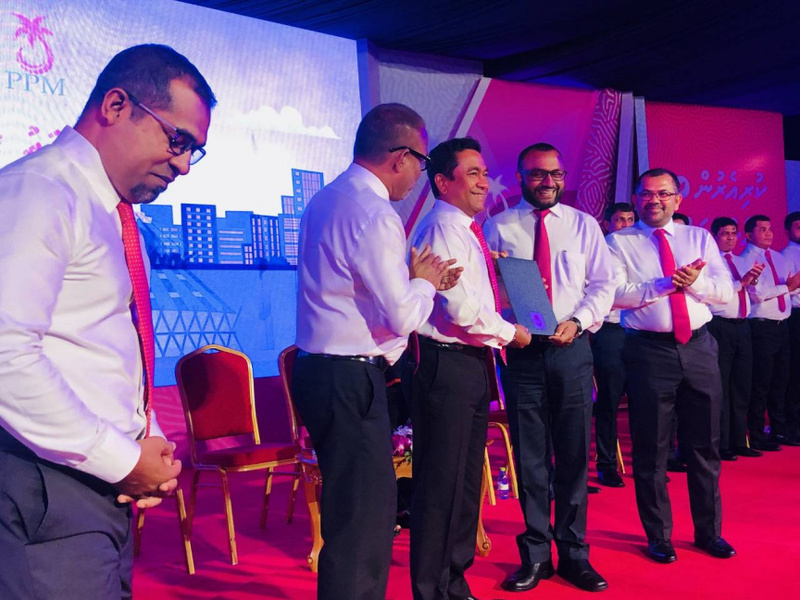 At an ongoing ceremony at Dharubaaruge tonight, the PPM nomination ticket was presented to President Yameen by the Leader of the PPM Parliamentary Group, Ahmed Nihan Hussain Manik. PPM also presented the Running Mate ticket to Dr. Mohamed Shaheem Ali Saeed at the ceremony tonight. It was presented to Dr. Shaheem by the Vice President of PPM, Abdul-Raheem Abdulla. The PPM Council decided to give the Election ticket to President Yameen last May. Vice President of PPM, Abdul-Raheem Abdulla said that the decision was made under Article 641 of the party regulations which states that if an elected person wishes to run again, the party must provide the opportunity. "We will not vote according to Adhurey's wishes"